I enter the office-building conference room and survey the damage around me. Blood and bits of flesh are splattered across the tabletops. As I creep closer, I see a pretty teenage girl with a bullet wound in her bruised and bleeding forehead, a vampire bite in her neck and a jagged piece of glass protruding from the wide gash on her forearm. She turns to me, flashes a big smile and asks, "How do I look?" 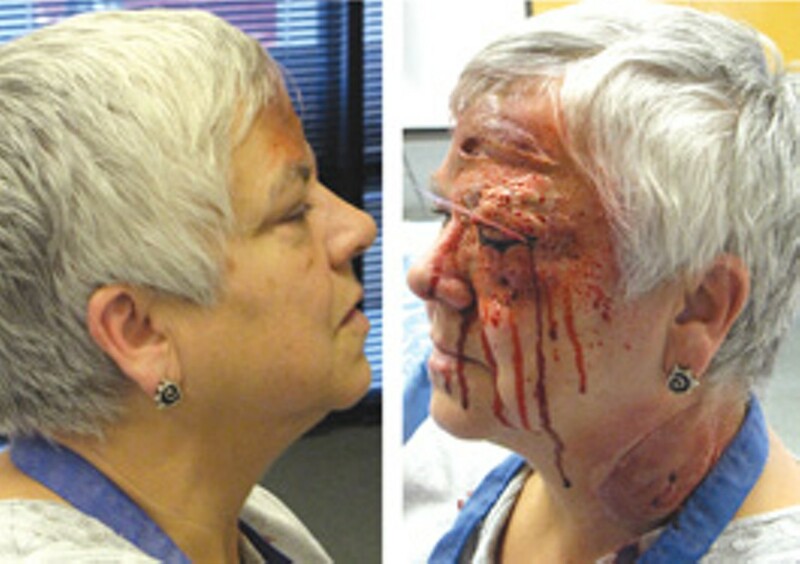 Thankfully, this is not the work of a mass murderer or a gun-wielding vampire, but that of a moulage artist, training volunteers for a Red Cross Halloween fundraiser. Moulage, from the French mouler, "to mold," has been in use for medical training since the Renaissance. Originally referring to the casting of wax models, moulage is now better known as the art of simulating injuries for educational purposes—realistic wounds created on "victims" to train emergency-response teams, military and medical personnel, Boy Scouts and others for disaster drills. The two basic components for recreating wounds include fake skin, or "schkin," and simulated blood of varying thickness. Recipes for both can be created with simple ingredients like cornstarch, Vaseline, cocoa powder and food coloring. Watercolors, black nail polish, lipstick, clean dried chicken bones, sticks and "glass" made from plastic containers are also used to create wounds. Colored oatmeal in a double-wrapped condom? Voilà—intestines. Cooked rice? Perfect for maggot-infested wounds. While a basic moulage kit is easily obtainable, the art of applying the makeup takes skill, and that's where Sonoma County Red Cross volunteer Fran Condon comes in. A lifelong crafter, Condon once took first prize at the state fair for carving an entire nativity scene from bars of Ivory soap. Her interest in sculpture translated to training in moulage, and she now instructs others. Recently, Condon took part in staging a "disaster" at the Santa Rosa Airport, helping to create 150 casualties for response teams to triage. "Moulage teams help CERT [community emergency response team] members to graduate," says Condon. "The examiners usually don't tell the potential graduates that triage victims aren't really wounded, so it's a shocking surprise when they come upon disaster scenes. The military also uses moulage for disaster drills in the field, and hospital workers use it to simulate surgeries." This Halloween season, teens earning community service hours will be applying moulage skills at five stations inside the mall in Santa Rosa, providing pièces de résistance for Halloween costumes—bullet wounds, lacerations, bruises, gashes and vampire-fang bites. Poked-out eyeballs can be ordered with or without protrusions, such as sticks or glass shards, and prices vary from $10 to $25 per faux injury. Moulage wounds wash off easily with soap and water, although if wounds remain untouched after application, with care they may last for six to eight hours. And that's just long enough to scare the hell out of the neighbors on Halloween night. The Red Cross applies really gross, creepy, disgusting moulage wounds to enhance your Halloween costume on Saturday and Sunday, Oct. 30 and 31, inside the Santa Rosa Plaza in downtown Santa Rosa. Saturday, 2&–8pm; Sunday, 2&–6pm. $10&–$25 per wound. 707.373.7132.